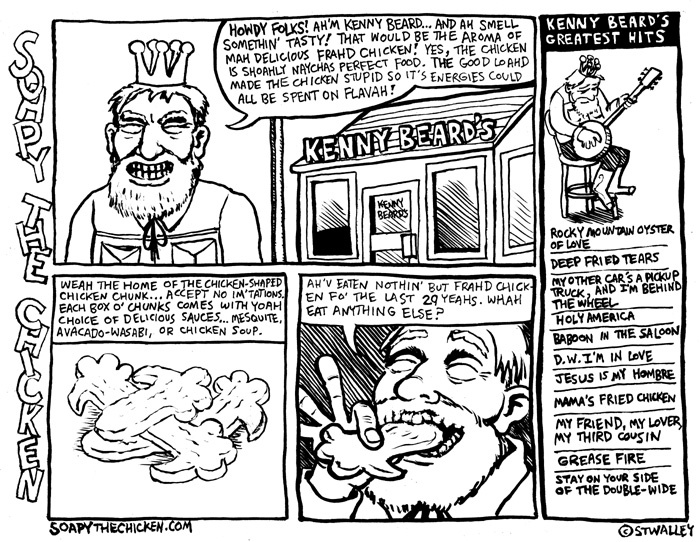 Today’s strip is not a Soapy strip… it’s a strip I just did to submit to the upcoming Spout Press Lush Cocktail Guide and Poetry Anthology. 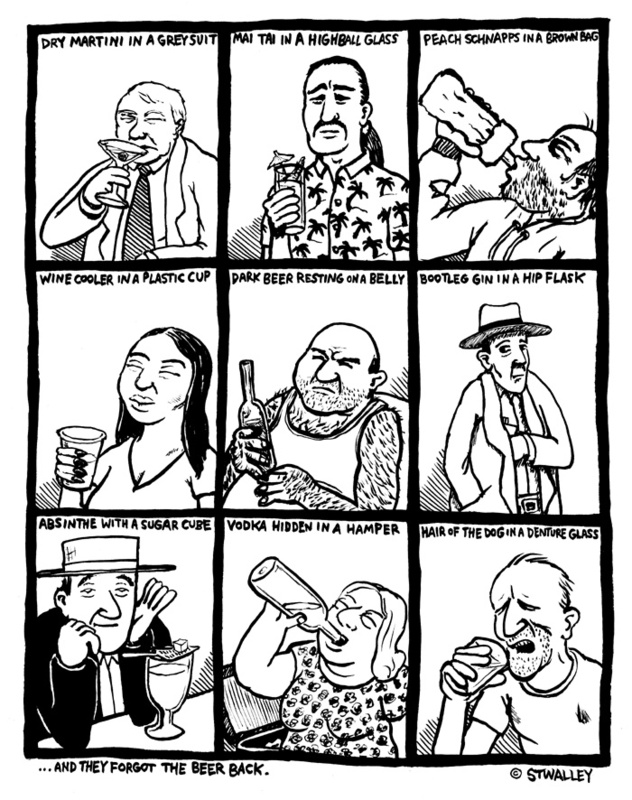 Cartoonists, there is still a little time to submit to the anthology, and they are actively looking for cartoons… drinking and drawing is encouraged. Amazing the things you can find searching the internet. 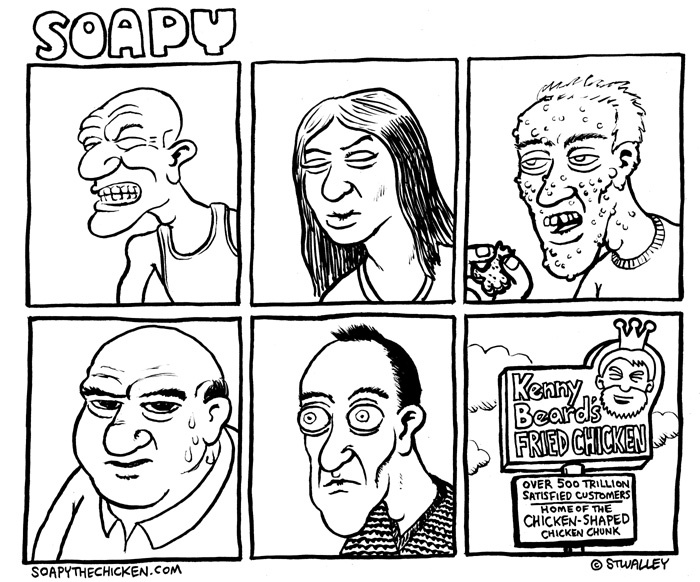 You can now rate Soapy here, using whatever criteria you wish. 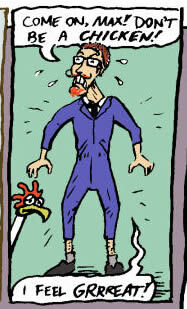 There’s a great comic strip by David Steinlicht and Julio Ojeda-Zapata in the St. Paul Pioneer Press today about Free Comic Book Day… you can see the whole thing here. 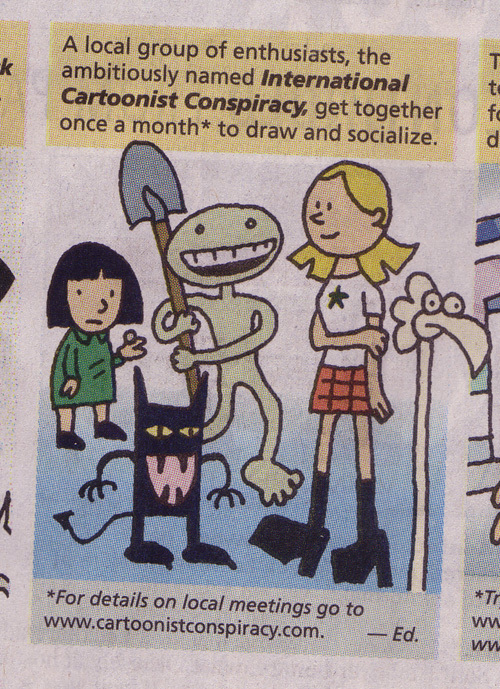 Best of all, it shows a bunch of characters from local cartoonists, and makes a nice mention of the Cartoonist Conspiracy in the panel shown below. Pictured in the panel, clockwise from left, would be the little girl in Zander Cannon’s “He Becomes Who Kills Him: A Horror Story” mini-comic from the Lutefisk Sushi Volume B box, one of Sean Tenhoff’s Bean Men, Bob Lipski’s Uptown Girl, Soapy, and one of Ken Avidor’s demons. The strip also mentions Twin Cities locals Sam Hiti, Ryan Kelly, Dan Jurgens, Patrick Gleason and, of course, Charles Schulz. Thanks much to Conspirator Steinlicht and Mr. Ojeda-Zapata for the plug! 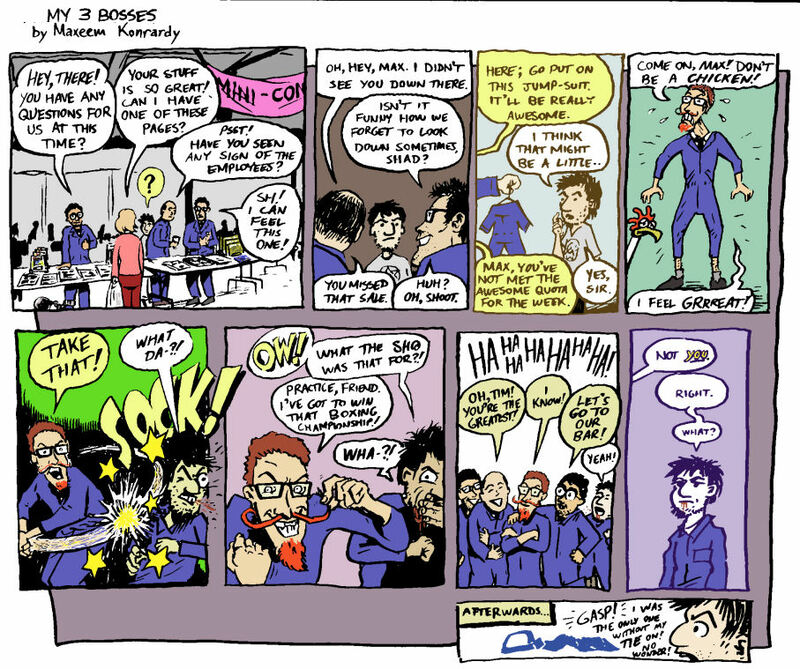 Check out Soapy’s guest appearance in Max Konardy’s funny weekly strip “My Three Bosses”… the strip chronicles Max’s ongoing weekly attempts at getting fired from his job at Big Time Attic by ruthlessly caricaturing his bosses. What a job! Thanks Max! 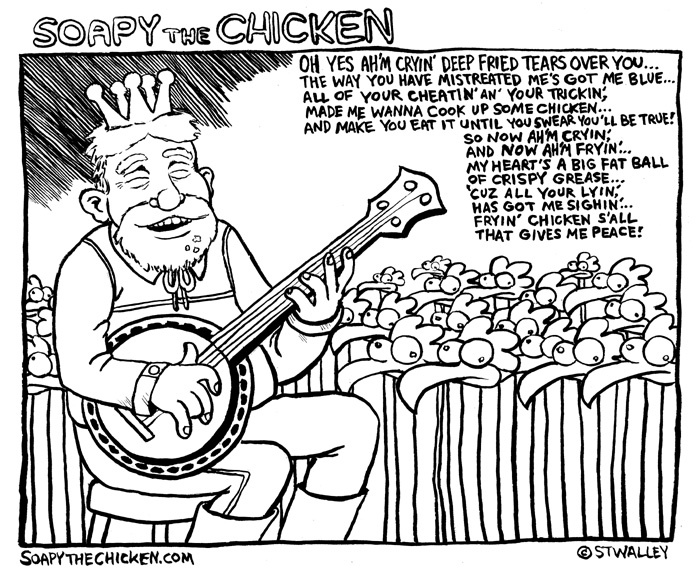 Speaking of Max’s bosses, one of them, Shad Petosky, just featured Soapy extensively in his Lutefisk Sushi comic… I’ll have to scan some of that. To see it, you’ll have to get a copy of the Lutefisk Sushi Volume B box set (which are still available for $25 and also includes the Soapy mini-comic and 48 other mini-comics by a total of 50 Minnesota comic artists). In Shad’s comic, he hilariously skewers many of the other comics in the box… a distinct advantage of doing a comic at the last minute before a deadline! 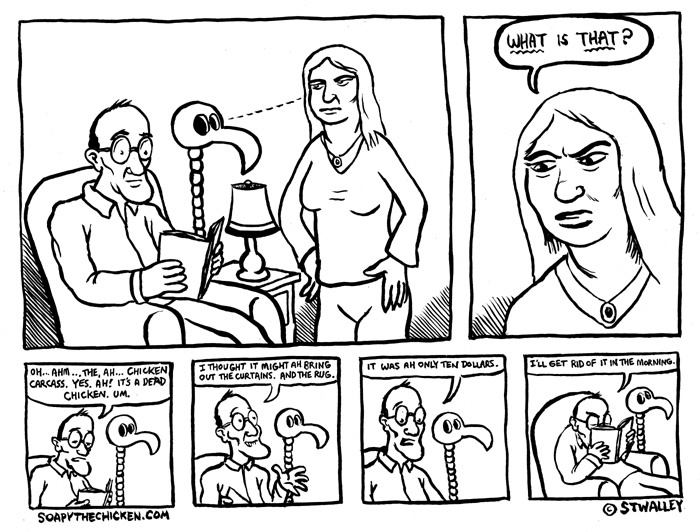 In it he caricatures me ruthlessly as well… I’m just thankful that I don’t have Konardy drawing me every week!